No matter how tiny your space – indoor or outdoor, garden, balcony or even a windowsill or tabletop – here you will find original and inspiring ideas. The projects range from an elegant fern terrarium and a scented spring bulb basket to colourful woven bags and sacks filled with cheerful summer blooms. There are edible gardens, including fruit bushes planted in catering-sized kitchen pans and a vertical garden of herbs grown on a wooden stepladder. You will find ideas for using salvaged containers, such as a metal bathtub filled with vegetable plants, food tins used for an indoor garden of wildflowers and wooden drawers filled with trailing plants. And at the teeniest end of the scale, there are miniature tabletop gardens created in eggshells! Children can learn basic gardening skills too, by following the step-by-step photos to make a magical fairy garden or a mysterious dinosaur terrarium. 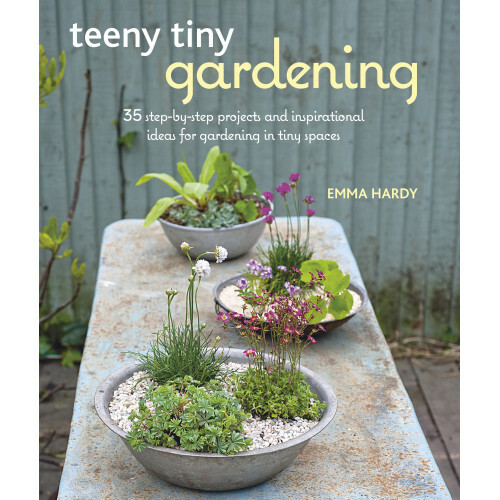 Whether you are looking for ideas for all-year foliage or for a summer display of flowers, wanting to grow your own veggies and herbs, or needing to revamp your balcony, Teeny Tiny Gardening provides all the inspiration and practical knowledge you need.